Replies: 14 (Who? ), Viewed: 7915 times. #1 30th Jan 2009 at 8:43 AM Last edited by aelflaed : 31st Mar 2009 at 1:07 AM. Mods, please move this to the appropriate section if neccesary. objects. I'm no modder really, but I had a number of older CC items that I wanted to have this feature. Luckily, I found someone to teach me how to do it. Since I know I won't remember how in a few months' time, I made a step-by-step tute for myself. First there was a hint on the process at MATY, and Tunaisafish helped me from there. It may also be useful to others, since I couldn't find one ready-made. It's quite easy, but requires the QA version of SimPE. The attached file is a PDF. Edit March 2009 - Okay, I've fixed the attachment which was AWOL. I'm posting the text of the tutorial here as well. Most of the pictures are too large to be posted, so get the PDF if you want the whole thing. This is a mini-tute on making custom wall-mounted objects shiftable for Apartment Life players. It's very easy. http://www.moreawesomethanyou.com/s...ic,12998.0.html. He gave some quick instructions for do-it-yourself updates too. First, you need the QA version of SimPE. If you don't have it, you need to go to the site (http://simpeforum.ambertation.de/forum/) and ask to be added to the QA testing group. Once approved, you can download it. Current version at time of writing is Version 73.35. Then, open the package you want to alter. Select the little blue folder from the top, and browse to the file you want. When the screen has loaded, select Behaviour Function (BHAV) from the Resource Tree window. In the Resource List window, select Function-Init. Click the Plugin View tab at the bottom of the screen. Scroll down to the bottom of the list of nodes in the bottom window. On the right side, tick 'special buttons' if it's not showing them already. 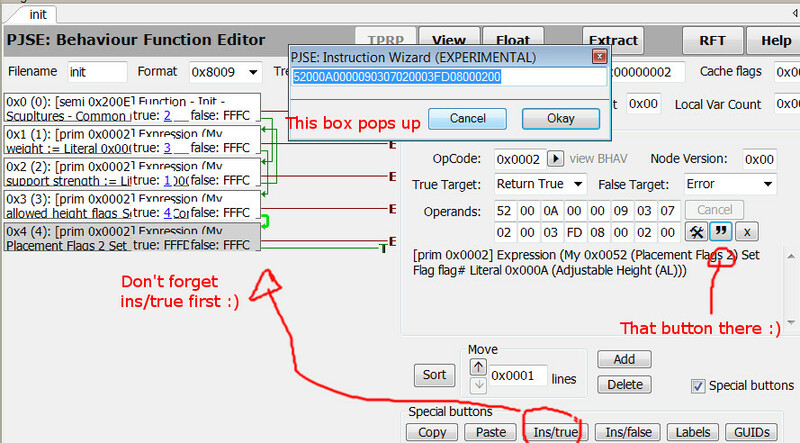 Highlight the bottom node (0xA in my example), and press 'ins/true' (special button) on the right. That will duplicate the node. Now we edit the duplicate node. Select the bottom one again and press the button that looks like a hammer and spanner. (to the right of all the 'Operands' values, in the 'Instruction Settings' box). This will give you the Wizard popup. Once you see the popup window, alter the values to match one of the two examples shown. It doesn't matter whether you use the Instance picker or the Hex values. Press Okay when you're done. Troubleshooting: If the popup you get doesn't look like mine, or is greyed out, you need to go back and alter the Opcode value before pressing the hammer-and-spanner button. The Opcode button is on the right. Change it to 0x0002, then try the editing button again. This time, you should see the correct wizard popup. 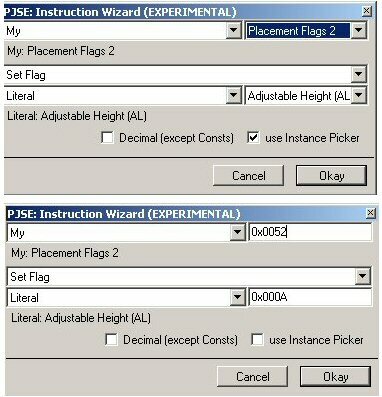 Alter the values as shown in my example above, and press Okay. Finished! Remember to load up the altered file and make sure everything is fine. Oh, and any copies of that object already being used in-game will probably have to be replaced, before the change will take effect. Now wasn't that easy? When you know how. Description: Easy tute for making shiftable wall deco for AL. I now know why. Thanks again! Getting an error with the link. Could you either post it the thread or upload again please? Hoping this will give me an insight into where to look for the quarter tile placement option. It probably got nuked in the recent server explosion. I'll fix it. Edit - should be good again now. Thanks for letting me know. Should this thread be moved to a tutorials section? Thank you for the tutorial - now even some of my pillows and other deco go up and down, and it's great! Thanks, Gwenke - nice to see you're still around, too! I have just learnt to recolour and Sims3 does not appeal to me, so yes, I guess I'll be around some more. Back on topic - did you know even ceiling lamps can be taught to go up/down? I'm having great fun with this. Cool! I haven't tried ceiling lamps - I've mostly 'fixed' decorative items and shelving that wouldn't shift. If I could just find out how to do the same for the M&G quarter-tile trick, that would be marvellous. Can ceiling lamps really go up? I thought you couldn't push things beyond the ceiling limits, and surely ceiling lamps are already there. Good if you can, though - great for attics and other non-flat ceiling spaces. I am not moving to Sims 3 - I've only just learned to hack objects, and there's plenty I still want to do with Sims 2. Wow that was incredibly easy! Thank you soo much for your tutorial it's really helpful! You can use this method on a lot of items. It's a very nice substitute for using OMSPs, so I make most of my items shiftable nowadays. #15 20th Mar 2019 at 9:56 PM Last edited by simmer22 : 20th Mar 2019 at 10:13 PM. You can also change the numbers in the Operands boxes so it matches what's seen in the picture, but come on, who's got time for that?